Quality Sport Planes was launched in the spring of 2005 to help promote and represent aircraft kits produced by Zenith Aircraft Company, a leading North American manufacturer of award-winning recreational kitplane designs. 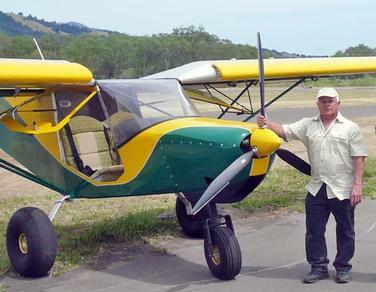 Now established in northern California's beautiful wine country, Quality Sport Planes offers sales services, regional support and builder assistance to enthusiasts of Zenith Aircraft Company's numerous all-metal cross-country and STOL kitplanes. We also offer regular public workshops and host two annual regional fly-in events for Zenith design owners/pilots. Our specialty is helping people acquire and assemble their Zenith Aircraft Kits: Partial kits, complete kits or Quick-Build kits. Builder-assistance at our hangar is available for smaller projects (i.e. tail or wing assemblies) and for full-on ready-to-fly Light Sport Aircraft (LSA). Call us today to discuss a custom program that meets your needs! Thank you for visiting our website. We hope you'll call soon for a tour our facilities, to look at our Sport-Pilot-Ready aircraft, or maybe even to go for a demo flight! Get started in Cloverdale with a CruZer Rudder Workshop! Based on the very popular STOL CH 701 / 750 / 801 aircraft designs from Chris Heintz that have been around for nearly three decades, the all new CH750 CRUZER incorporates Zenith's proven ease of construction and great flight qualities. The new Cruzer is optimized for faster cruise speeds all the while retaining surprisingly short-field capabilities. Call us for more details or to start building your own! Videos show just some of the planes & people at our last Open House; join us next year for another edition! Click here to view Doug's latest video on the aircraft and services offered through Quality Sport Planes! we use ours to hold pencils on our front desk. You can order on-line at any time. All are fun accessories if looking for gift ideas! Click here for complete product list.